When tomorrow arrives, God will give you the power, perspective, grace, and wisdom you need. “Don’t worry about tomorrow, because tomorrow will have its own worries. Each day has enough trouble of its own” (Matthew 6:34 NCV). Hurry creates worry. Matthew 6:34 says, “Don’t worry about tomorrow, because tomorrow will have its own worries. Each day has enough trouble of its own” (NCV). There are two days you should never worry about: yesterday and tomorrow. You can’t live in the past. You can’t live in the future. You can only live today. Why should you only live one day at a time? First, when you worry about tomorrow’s problems, you miss the blessings of today. Second, you cannot solve tomorrow’s problems with today’s power. When tomorrow arrives, God will give you the power, perspective, grace, and wisdom you need. The Bible does not say, “Give us this day our WEEKLY bread.” It says, “Give us this day our daily bread” (Matthew 6:11 ESV). God wants you to depend on him one day at a time. He will provide everything you need. You will lack nothing. It’s okay to plan for tomorrow. Just don’t borrow trouble from tomorrow. 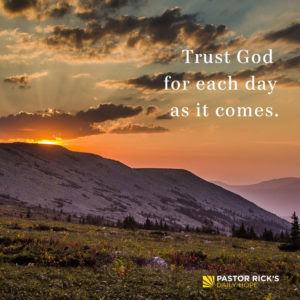 Trust God for each day as it comes. Spend five to 10 minutes today reciting and meditating on Psalm 23. What other Scripture passages would be helpful to remember when you start to worry? What are you worrying about from your past that you need to surrender to God? What are you worrying about in the future that you need to trust God for today?